If you’ve ever seen a “great” songwriter interviewed about their songwriting process before, you’ve probably noticed something very mysterious. The musical “greats” ALWAYS mention how song ideas seem to “hit” them, seemingly of their own accord. Completely “out of the blue”. Well, it’s actually one of the true secrets to songwriting. And yes, it’s possible for absolutely anyone to learn how to do this. In fact, these “out of the blue” inspirations are actually a natural gift that’s common to all humans. But why do only a select few report these amazing events? First though, let’s clarify what I actually mean by ideas striking “out of nowhere”. To Do This, Let’s Look At Some Quotes From Famous Musicians. Now, Michael has experienced this “out of the blue” phenomenon to an even greater extent than just being hit by an idea. Now notice as you read this quote Michael didn’t really feel as if hecreated the song ideas. They just appeared in his dream and he then was able to document the ideas. And the thing is, you’ll find quotes like this from songwriterseverywhere. Ideas arriving in dreams… Ideas coming to them seemingly out of nowhere. Well, first let me tell you that youhave this ability within you as well as these hit songwriters. It’s very possible for you to train yourself to have these miraculous “strikes of inspiration” too. In fact, you can program yourself in a way that causes these moments to happen to you all the time. And I’ll tell you exactly how you can do this in a second. Right now though, I want to discuss the reasons that these “ideas out of nowhere” occur. The creative process works at it’s most powerful best in the unconscious mind. All this means is that inside your mind you have both conscious thoughts(the thoughts that you notice as you go throughout your day), andunconscious thinking (The processes that go on inside your mind outsideof your awareness). Now your conscious thinking is very limited. There’s only so much that’s possible with it, and when it comes to creative tasks it’s borderline useless. It’s ability to create is both miraculous and unlimited. Now, when you suddenly have a “strike of inspiration”, like we were discussing earlier, what’s happening is you’re receiving an idea that has been created by your unconscious mind. You won’t really feel you created it, because the creation process happened outside of your awareness… but you certainly were the creator. The great news is: Once you are familiar with this creative process you suddenly have tremendous songwriting powers at your disposal. It’s this unconscious creating that separates the average songwriter from the "genius level" composer. And the amazing thing is thatanyone can learn how to create in this way. Now you’ll notice I’ve been noticing that throughout this article I’ve mentioned that it’s possible to train yourself to create with your unconscious mind, which will results in you having many moments of profound inspiration. I discovered this a few years ago when I did extensive research into the creativity process, and tore apart many studies of human genius. Out of this research I compiled and created many powerful songwriting techniques that use the full potential of your highly creative unconscious mind. When you use these techniques, you’ll find it ridiculously easy to have song idea after idea of a quality you’ll have to hear to believe. It really is true that the vast majority of musicians completely “miss the boat” when it comes to songwriting – partly due to their rigid training in music theory. But you on the other hand, can “break free” of this, and begin to experience the massive potential you have within you. I promise that when you use these techniques, you’ll have breakthrough after breakthrough, and you’ll experience of songwriting will never be the same. 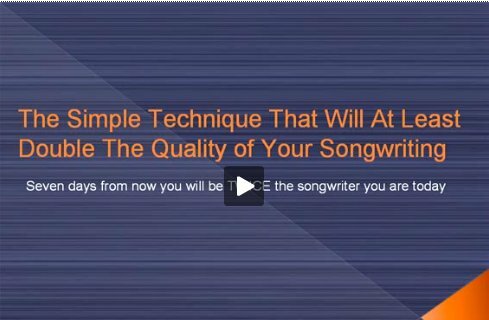 To Access These Songwriting Techniques, Click Here. On the page I’ve just listed you’ll find information about a course that I put together, which contains the fruits of my research. In my humble opinion it is the most powerful musical training available anywhere, simply because it uses principles from the “musical geniuses” who have come before us – the people who have gotten better results than anyone else! I promise that this songwriting training will completely change the way you write music and lyrics. Once again, here’s the link to the training that will show you how to cause magical inspiration occur to you, over and over again – seemingly of it’s own accord. keep on working i hear you. You are right! I just had a song running through my head when I awoke the other morning and it went right to paper as soon as I crawled out of bed!